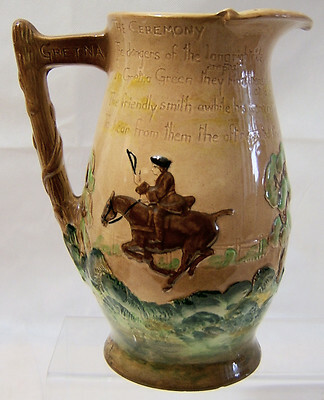 One of several (currently) delightful Water Jugs from Burleigh Ware , each with an embossed decoration around the Jug and each with a stylish handle featuring some form of further decoration. 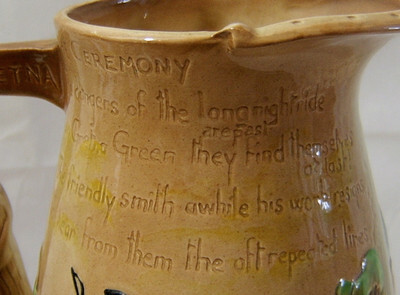 On his occasion, it is a Horseshoe which provides extra decoration around the spout rim and a wheatsheaf on the handle. 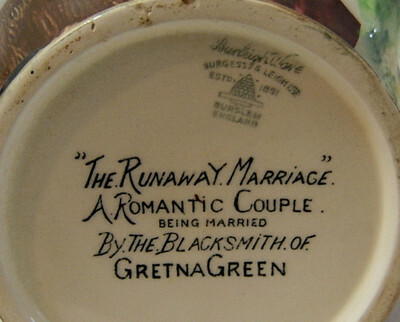 This one is the 'Runaway Marriage' Jug, produced, I think, in the late 1930s (maybe early 40s). 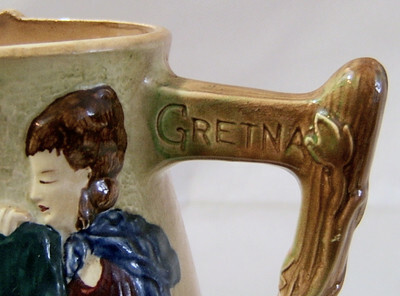 There is the word Gretna is impressed into either side of the handle, a pithey rhyme on the rear of the Jug and, of course, details of the subject matter on the base. There is a fine multicoloured picture of the Wedding Ceremony on the front all set on oatmeal ground. The Jug is in perfect condition. No chips, nibbles and, even more so, no crazing. 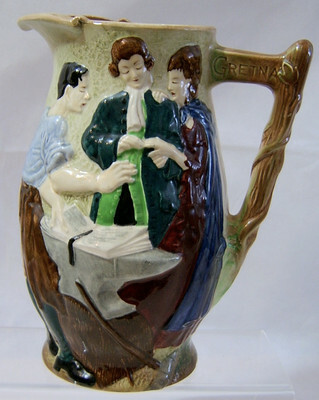 It stands just about 8.5 inches (22 cms) tall and has a base diameter of 4 inches (10 cms).